They are preparing for a party at Sage Gateshead. It will be a 10th birthday bash, marking a decade since the doors of Sir Norman Foster’s extraordinary building were first opened to the public. It only seems a short time since that winter night in December 2004, writes Sage general director Anthony Sargent in the special anniversary events diary. He is right. Those who were there will remember it well... the warmth of anticipation keeping out the cold, the twinkling of the lights along the Tyne seen from a new vantage point, the curves of a building like a great passenger liner waiting to be launched. Inside there were aerialists, musical taster sessions and speeches. But as with neighbouring Baltic a couple of years previously, the real star of the show was the building and its beautiful performance halls. People had watched it rise from the mud of Bottle Bank. That December night was a glorious beginning but it was also a point on a journey. A few years previously Gateshead had secured the rights to go for the regional music centre – as the building was first described – and secured the all-important arts lottery grant of £43.8m to make it happen. Days after the money was announced, Anthony Sargent was appointed to run the place. He had been with Birmingham City Council for 10 years, was currently in charge of its arts and entertainment and was on secondment to the BBC for its Millennium Music Live festival (the Millennium that was also to give Gateshead its ‘blinking eye’ bridge). “This is a unique opportunity to be responsible for a new project which will be a decisive force in the musical life of the North East as well as the nation,” he said. A few months later, speaking in the old St Mary’s Church that was the temporary home to the teams from Baltic and the music centre (Sage Gateshead as it would become when the North East software giant paid handsomely for the naming rights), Anthony expressed his passion for music, for broadcasting and for education. He spoke of the democratic approach to music that would drive the new building and the community programmes and concerts emanating from it. “In the 1950s there was this notion that classical music was in some ways more important than other kinds of music, that it was a deeper, richer type of activity. “In some respects this hasn’t changed. The people who programme arts events might tell you that they take jazz, folk and Afro-Caribbean music as seriously as classical. But then you see that all those concerts are scheduled for Tuesday lunchtimes. Tenth anniversary events are threaded through the December to February programme, but the big bash begins on December 16 with Beverley Knight in Hall One and a breakdance competition in Hall Two. On December 17 – the actual anniversary – a special Now We Are Ten concert will feature an eclectic line-up including vocal chamber group the Hilliard Ensemble (giving their penultimate performance) and North East specialists in electronic music, Warm Digits. On December 19 the Sage team plans to turn the building’s concourse into “the greatest superclub on Tyneside” as Above&Beyond, specialists in electronic dance music, top the line-up for Northern Lights ‘Winter Edition’. As an all-nighter, running from 10pm to 4am and with capacity for 2,500 people, it is another Sage first. The plan is for the look of the building to be transformed by a special lighting installation. Most of the action takes place over the weekend of December 20 and 21. In Hall One the Royal Northern Sinfonia will join the Inspiration Choir for two Christmas concerts on the Saturday and reconvene on the Sunday for a Beethoven and Tchaikovsky concert with conductor Thomas Zehetmair. Paul Smith (Maximo Park) and Peter Brewis (Field Music) will give a repeat performance of Frozen By Sight (its premiere came during the Festival of the North East in 2013) in Hall Two on the Saturday and, on the Sunday, the venue will host Eliza Carthy as she and others celebrate 25 years of the Folkworks Youth Summer School. There will be family fun on the concourse on both days and Christmas ceilidhs to encourage everyone to let their hair down. It should all add up to a memorable week for a building that has become an important part of so many people’s lives. As Anthony Sargent prepares to move on to pastures new after a job well done, new attractions and new challenges lie ahead. For now, though, let’s party! 1 The building: The £70m Sage Gateshead was the first cultural building designed by Foster and Partners, Sir Norman Foster’s architectural practice, so the eyes of the world were on it from the start. With its ample curves, it is now one of the region’s most distinctive buildings. Its two concert halls, with vital input from Arup Acoustics, seat 1,700 and 400 people respectively and they sit above a 25-room Music Education Centre. The concourse offers wonderful views of Newcastle and the Tyne. 2 The concerts: So many and all memorable in their own way. James Brown, Lesley Garrett, Bryan Ferry, Sir Thomas Allen, José Carreras, Seasick Steve, Sugababes, Kathryn Tickell, Sting, the Royal Northern Sinfonia and umpteen choirs, ensembles and renowned soloists have trod the boards in Hall One or Hall Two. There have been more than 4,500 performances over 10 years in the broadest spectrum of genres. Personal favourites include the premiere of Skellig, the opera, in 2008, Opera North’s Ring Cycle, performed over four years, and Kathryn Tickell’s Festival of the North East concert in 2013. 3 The education: “There is so much frankly tokenistic stuff talked about education being a very important part of the arts,” said Anthony Sargent on his appointment. “With the Music Centre, education is absolutely fundamental to the project, whether it is a conductor talking to an audience about a piece of music or children having tuition.” He has been true to his word. Some of the region’s brightest youngsters are on the Young Musicians Programme while others perform in the ensembles listed below. There are sessions for pre-schoolers and the over 50s (the Silver Programme) and Sage runs degree courses in community music and in jazz, popular and commercial music with Sunderland University. Sage is one of 10 national Bridge organisations, funded by Arts Council England, helping to connect young people with art and culture. 4 The outreach: The work of Sage Gateshead extends far beyond the building. In the past 10 years it has provided music-making sessions to more than a million people in more than 1,000 places. A heartwarming example of its work is to be seen at Hawthorn Primary School in Elswick, Newcastle, as part of the In Harmony programme. Inspired by a scheme in Venezuela, the children in the school have been given access to musical instruments and music has become ingrained in the curriculum. Youngsters who might never have had a chance to express themselves musically are learning new skills and forming groups and ensembles. Meanwhile CoMusica works across the region with young people aged five to 24, many of whom live in challenging circumstances. 5 The music groups: Some of the region’s keenest and most talented young musicians perform in Sage ensembles including Jambone, Folkestra and the Quay choirs, one for lads and one for lasses. They perform to an exceptionally high standard and have entertained the Queen among many others. But Sage also has adult instrument groups (you have seen nothing like a massed ukelele band) and singing groups. Check out groups such as In The Groove, Old Town Voices and the Sage Gateshead Chamber Choir on the Sage website. 6 Royal Northern Sinfonia: The region’s professional chamber orchestra, founded in 1958, was a founding partner of Sage Gateshead, along with Folkworks. Since moving into its new home, a period coinciding with the start of Thomas Zehetmair’s period as music director, the orchestra has gone from strength to strength, working with some of the most in-demand classical artists and conductors in the world including Sir Mark Elder, Ian Bostridge, David Lang and Heinz Holliger. It has also worked with Sting, Pet Shop Boys, Kathryn Tickell and with the youngsters on the In Harmony programme. In June 2013 the Queen bestowed the title ‘Royal’ on the orchestra. 7 The people: Many who work at Sage Gateshead are music mad. Some are performers in their own right. Anthony Sargent came to Gateshead describing himself as “lapsed bassoon player” but he was a university choral scholar and also conducted. Philippa King, an event producer in Sage’s conference and events team, graduated from a Sage degree course and sings in the Philippa King Band, performing at weddings, festivals and events. 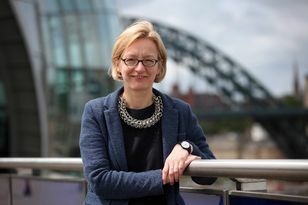 Sage has provided a platform for North East musicians who went away to further their careers, such as conductor John Wilson and cellist Jonathan Bloxham, both from Gateshead. 8 The profile: Anthony Sargent, on his appointment, said many people outside the region knew the Music Centre was to be in Gateshead. They just weren’t sure where Gateshead was. “But they will,” he promised. “It is part of the longer positioning process.” Now Sage boasts a regular Classic FM series of concerts and also has concerts broadcast live by the BBC. BBC Radio 3 takes over the venue for its autumn Free Thinking Festival and the venue has twice hosted the BBC Young Musician contest. Its regular festivals, such as the Gateshead International Jazz Festival and SummerTyne Americana Festival, get national attention. 9 The conferences: People don’t only descend on Sage for music. In 2006 it hosted the World Summit on Arts &amp; Culture and it has also been the venue for several political conferences. “One of our most successful events ever,” said the appreciative events director of the British Council for Shopping Centres. Various medical gatherings have also availed themselves of the venue’s facilities. It has been estimated that Sage has contributed £300m to the regional economy. 10 The weddings: Some people love the building so much they get married there. More than 100 couples have tied the knot at Sage Gateshead with the biggest wedding attended by more than 700 guests. Some of these special couples will return to the building on December 21 for a special dinner and concert.